Before the opening of City Hospital in 1905, surgeries were usually performed in doctor offices, and patients recuperated in the home with care from private nurses. Although physicians enjoyed great respect in their communities, the hours were long and exhausting, and their families generally suffered some measure of neglect as these doctors literally gave their lives to caring for their patients. Below is a list of some of the men and women who practiced medicine in East Liverpool and surrounding communities. The list is certainly not complete, and the author begs forgiveness for those physicians who were inadvertently omitted. CHARLES HODGE BAILEY, M.D., 1881-1967 - Bailey, nephew of Dr. W.N. Bailey, shows up in the City Hospital surgery records as early as 1911. He served as a battalion surgeon with the U.S. Army Medical Corps in World War I, and came back with a desire to do little but surgery. He and Hobbs were charter Fellows of the American College of Surgery. Many of Dr. Bailey's patients never received a bill for their surgeries. He was financially secure and had a soft heart for families of modest means. Ambidextrous, he could sew a patient up with either hand, could quote Yeats and Toynbee, and could give a learned dissertation on nearly any subject. Dr. Bailey and Dr. John Fraser became leaders of the ELCH medical staff following the death of Dr. Hobbs. W.N. BAILEY, M.D. 1850-1935. His name appears often in the early O.R. log. Uncle of Dr. Charles Hodge Dailey. H. FRED BANFIELD, M.D., 1915-1989 - Started in family practice in 1947 here in partnership with brother William S. Banfield, M.D., and two other physicians. Later specialized in anesthesiology in partnership with V.E. McEldowney and K.W. Turner. Gave up family practice about 1983. WILLIAM S. BANFIELD, M.D., June 21, 1909-March 30, 1994 began local practice in Irondale in 1934, opened East Liverpool office in 1946. GP who eventually specialized in 03, delivering an estimated 10,000 babies. Caused some commotion among peers because he charged $35 for a delivery when the going rate was $25, and insisted upon prenatal and postnatal care, when other doctors didn't see the mother until she went into labor. Instrumental in founding local Planned Parenthood clinic. Served 34 years on Edison Local Board of Education, 24 of them as president. DUDLEY H. BEAUMONT, M.D., Aug. 2, 1895-Feb. 16, 1981 - A son of New Cumberland, W.Va., physician Dr. Frank Beaumont, Dr. Dudley H. Beaumont was in general practice in Wellsville from 1923 to 1969. RICHARD J. BONISTALLI, M.D., 1910-1973. - City Hospital's first formally trained radiologist, practicing here 1958-73. THOMAS S. BOYD, M.D., Sept 24, 1910-Feb. 25, 1984- General practice physician in Midland, Pa., from 1938 to his retirement in 1980. He was Crucible Steel's company physician 1944-80 and Midland High School physician 1942-60. His office was below his residence at 830 Midland Ave. He did a lot of deliveries, bringing 'most of Midland" into the world. JOHN MARCUS BRAND, M.D., 1910-1984. Chester general practitioner for many years. Held the West Virginia scholastic one-half mile track record for 30 years. Had a reputation for absent-mindedness because of he drove with the windshield wipers on regardless of the weather, but those dose to him said he did it to keep himself awake. MELBOURNE PEARCE BURNETT, M.D., June 12, 1915-March 18, 1984. Went to Stanton Military Academy Virginia, Colgate University for undergraduate, and Tufts Medical School in Boston. Served in World War II and Korean War as a Navy doctor. Came to East Liverpool after the war. Ran a lab and was board- certified in pathology, but did mostly family practice. His office was on St. Clair Avenue Ext., and lab at 124 W. 5th St. Served Beaver Local athletics many years and was company doctor for several of the big potteries, Sterling, Taylor, Smith and Taylor, Hall, and Homer Laughlin. Had six sons, one is deceased. J. WALLACE CHETWYND, M.D., March 1881-July 6, 1945. An ear, nose, throat doctor who later became City Hospital's radiologist. Native of Wheeling, graduate of Kenyon College and Jefferson Medical School. Located here in 1915. ROY C. COSTELLO, M.D., Nov. 11, 1904-1973 - City Hospital's pathologist from 1933 to 1972, Dr. Costello was also head of the lab after 1942 and founded and directed the blood bank from its inception in 1951. A native of East Liverpool (ELHS Class of '23), Dr. Costello maintained a private practice in the Little Building from 1933 to the mid-1960s and did surgery from 1945 to 1965. He was physician to the lay county coroners until. 1959, when coroner Dr. William Kolozsi appointed him thief deputy coroner. His medical degree was from the University of Pennsylvania (1931). FRANK F. DAVIS, M.D., July 20, 1875, December 1941. GP practicing in East End. Served on hospital board. ROBERT DUNLAP, M.D., 1914-1991. Longtime local physician. Partnered with Drs. Fred and Bill Banfleld after WWII. ALEXANDER S. FISHER, M.D., Jan 5, 1909-Nov. 23, 1983 'The' pediatrician to generations of East Liverpool parents and their children, Dr. Fisher practiced medicine locally more than 50 years. He practiced pediatrics and obstetrics here before serving as a flight surgeon in WWII, then returned to practice pediatrics. In addition to numerous civic and medical honors, he received the Prime Minister Award by the State of Israel in 1981 in part for his efforts in raising money through Israel Bonds and United Jewish Appeal, and he made 42 trips to the Holy Land. CHARLES A. FRASER, M.D. Wellsville physician, married Sarah, one of the McConnachie sisters, early nurses at ELCH. Uncle and namesake of Dr. J. Fraser Jackson. They had no children and lavished much love and attention on young J. Fraser. Dr. Fraser loved to travel, fish and hunt, and would take off for months at a time to trek the American West. But such was his skill and reputation that the day after he returned, his waiting room would be filled. 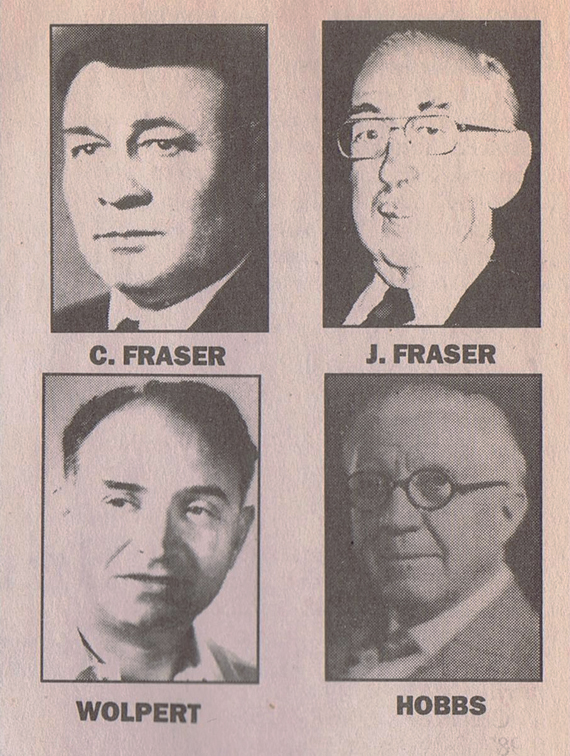 JOHN A. FRASER, M.D., 1895-1977 - A surgeon and general practitioner who kept meticulous records on the 30,000 patients he treated in his career, Dr. Fraser was a respected and influential member of the medical staff. Wore a fresh white rose in his lapel every day. In 55 years of practice he delivered 5,784 babies and performed 1,702 appendectomies, 675 C-sections, 521 gallbladder operations, 1,089 hernia repairs, 4,248 tonsillectomies and 906 hysterectomies ... and once removed a harmonica from the stomach of a young boy. CHARLES GERACE, M.D., 19121987 Surgeon and general practitioner, 1930 graduate of ELHS, attended Ohio University and received his medical degree from Georgetown University, Washington, D.C., in 1938. Interned Mercy Hospital, Pittsburgh, 1938-39, joined staff at ELCH in October 1940. Appointed to the board of trustees same year. WILLIAM NOAH GILMORE, M.D. 1858-1934. Grandfather of Dr. Bill Gilmore. WILLIAM S. GILMORE, M.D., 1914-1967 Grandson of William Noah Gilmore, M.D. Dr. Bill brought back a wife from medical school, Dr. Edith Gilmore. After several years of practice they founded the E.L. Extended Care Center across 5th St. from the hospital. Shortly thereafter he died suddenly of a heart attack. EDITH GILMORE MILLER, M.D., 1915- She and her husband Dr. William Gilmore began practice here in the 1940s. Their first office was in the Dollar Bank Building where his grandfather had a medical practice. She and Bill opened the E.L. Extended Care Center in 1965 and he died in 1967. She operated it and continued her medical practice, selling the nursing home in Jan. 1, 1984. She did a lot of OB in her early years, and geriatrics in her later years. She is retired and living in East Liverpool with husband Paul Miller. M.M. GOYFLIEB, M.D., 1907-1969 - General practitioner who also developed a specialty in dermatology. DR. ROSAMOND HATHAWAY opened her practice in 1895 on W. 8th St. From 1911 to her death in 1915, her office was in the IOOF Bldg. on Sixth St.
FRANK REQUES HARRISON, M.D., Aug. 14,1879-Dec. 4, 1933 Born in the Staffordshire pottery district of England. His father was a skilled potter who later became foreman of the C.C. Thompson pottery. Dr. Harrison died at age 54. His son Francis became a doctor. WILBERT A. HOBBS, M.D., F.A.C.S., 1862-Oct. 17, 1939. Considered founding father of City Hospital, most respected physician of his time in this region. Graduated 1884 from University of Michigan medical college; one of the Mayo brothers was a classmate. Consulted widely. General practitioner with a specialty in surgery; charter Fellow of American College of Surgery. Thirty-two members of hospital's nursing staff attended his funeral as a group wearing caps, uniforms and blue and red cloaks. WILLIAM J. HORGER, M.D., Sept. 6, 1908-Nov. 29, 1990 Practiced medicine 58 years, beginning in 1932, the same time Dr. Bill Banfield and Dr. Jacob W. Schoolnic began practice. General practice in the East End, delivering thousands upon thousands of babies. First member of the City Hospital medical staff called to active duty in World War II. GEO. PIERCE IKIRT, M.D. - 18521927. One-term Democratic Congressman from East Liverpool. Co-publisher of The Weekly Crisis. Brick, mansard-roofed home at Sixth and Jackson has been restored. GEORGE KEMENY, M.D. - World War II concentration camp survivor who immigrated to the U.S. and opened a general practice in Wellsville about 1950, where he practiced 20 years. His daughter became a physician. Dr. Kemeny was an accomplished linguist, speaking more than seven languages. EUHONG KIM, M.D., Jan. 10, 1937- January 1985. Radiologist who received his M.D. at Seoul National University of Korea, interned at Trumbull Memorial and did his residency at Youngstown Hospitals. He worked at Sandusky, Ohio, two years before coming to ELCH in 1977 to practice with Dr. Paul Lim. He died at age 48 of cancer, leaving his wife, Sucho, and daughters Mimi and Jennifer. Mrs. Kim still resides in East Liverpool with her mother-in-law, Gilsa Kim. JENNINGS MATSON KING, M.D. Moved to Wellsville to practice in 1915. Was examining physician for the draft board in WWI. Died in 1927. JENNINGS MEADE KING, M.D., July 17, 1898-April 8, 1938. Took over his late father's practice in 1927 and later became head of orthopedics at West Penn Hospital in Pittsburgh, while maintaining staff privileges at City, coming here every other week. He died of pneumonia in 1938 at the age of 39. CLYDE RAYMOND LARKINS, M.D. 1875-1945. A leading doctor on the medical staff. 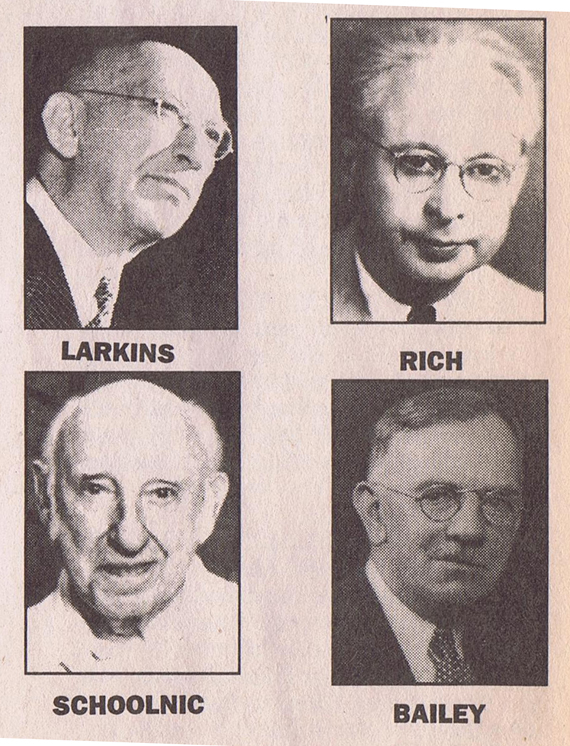 After the 1934 death of Charles R. Boyce, who chaired City Hospital's Board of Trustees for 27 years, Dr. Larkins served as president of the board for 10 years the only time a doctor held this position. FRANK L. LEWIS, M.D. 1873-1933 - Chester general practitioner whose office was in his house on Virginia Avenue. He had an extensive medical library and one of the first automobiles in town. ROBERT JAMES MARSHALL, M.D., Nov. 26,1862-March 2, 1936. Had offices where Atty. Tad Smith is now on 5th St. He practiced medicine for 50 years, and served nine years on City Council and one term as East Liverpool mayor. One of his daughters, Roberta, married Arthur Wells of Homer Laughlin China. MERLE McCUTCHEON, MD., 1885-1957. General practitioner who became hospital radiologist after the death of Dr. Chetwynd in 1945. Father of Brigadier Gen. Keith McCutcheon, who rose to the top echelon of the U.S. Marine Corps. VIRGIL E. McELDOWNEY, M.D., 1897-1965 - Newell, W.Va., general practioner; later started and chaired department of anesthesia at ELCH. As a medical student and intern at Louisville Medical School (graduating 1920), he experienced the terrible influenza epidemic of 1918. Came to Newell in 1924; Lost his first son at age six to polio; his second son, a B-17 gunner, was shot down and killed over Belgium. Two daughters survive, as well as a son by his second wife. ALBERT F. MICHELS, M.D., Dec. 17, 1893-Dec. 11, 1965 Surgeon and general practitioner. Did a lot of 08. Graduated 1919 from Pittsburgh Medical School. EDWARD WINFIELD MISKALL, M.D., 1900-Aug. 14,1948 - A 1926 graduate of the Ohio State University College of Medicine, he was an internal medicine doctor who specialized in cardiology. He had a family history of heart disease, told people he would die of a heart attack, and did so at age 48. DAVID S. PUGH, M.D., 1919- Family practitioner, took over Dr. Milton WoIpert's Chester practice in 1947. Received M.D. from University of Pittsburgh. Retired in 1993. JOSEPH L. PYLE, M.D., Dec. 2, 1866-Oct. 23, 1935. Graduate of Keokuk Medical School. Delivered the future Dr. David S. Pugh. ROSE TURNEULL POWELL, M.D. Practiced here in 1905 until going west about 1926. STEPHEN G. SINCLAIR, M.D., 1914-1982 - Ophthalmologist who practiced in East Liverpool for many years. His office was on Sixth Street. SAMUEL RICH, M.D., 1889- Dec. 15, 1982 - After eight years of general practice, Dr. Rich decided to specialize in eye, ear, nose and throat work, a practice which evolved into doing only eyes, and joked his next level of specialization would be "only the right eye." Dr. Rich practiced for 50 years and lived to be 93, living his later years at the Travelers Hotel. He came to East Liverpool from New York City with his parents and was a 1906 graduate of ELHS. He was graduated in 1910 from the Jefferson Medical College in Philadelphia. EMIL ROS, M.D., March 20, 1926- Nov. 11, 1994 - A native of Czechoslovakia, Dr. Ros was graduated from Komensky University Medical School and practiced family medicine in Czechoslovakia and Austria before immigrating to the U.S. He lived in Wellsville since 1975 and had his practice on St. Clair Ave. Two of his children, Anton and Emil, are also doctors. His daughter Maria Ros Poss managed his office. J. KEITH RUGH, MD., 1911- Surgeon and general practitioner, Dr. Rugh set up medical battalions in Central America during World War II. Discharged as a major Jan. 20, 1946, he returned to complete a surgical residency at Presbyterian Hospital, Women's, Allegheny General and Children's in Pittsburgh before setting up private practice in East Liverpool in 1950. His surgical innovations at City Hospital included early use of heart massage, new burn treatments, implanting mesh to repair massive hernias and creating a mechanical intestinal resection clamp. In his later years he continued to see patients at his home office for $5. . .or free. SLOAN SISTERS - Dr. Jeanne Sloan began medical career in 1886, continued into the 1950s - more than 60 years. Was a homeopathic doctor not on staff at ELCH. Sister Edith began dentistry practice in 1892. WILLIAM Z. SULKES, D.D.S., 19271981 - Member of the hospital's dental medical staff; shot to death by a mentally disturbed patient in the ground-floor lobby of the Potters Savings Building on Broadway. DR. WILL TAYLOR - Dr. Taylor opened a private hospital and training school for nurses in 1892 at 2nd and Union Sts. It operated until the early 1920s. HARRY A. TURK, M.D., 1882-1936 - Started practice in Newell, moved to East Liverpool by 1929. Lived in the existing house across 5th St. from City Hospital. ARTHUR L. TURNER, M.D., April 25, 1893-July 15, 1990 General practitioner who pioneered here in anesthesia, partnering with Dr. McEldowney and others. Graduated 1920 from Jefferson Medical School in Philadelphia, set up practice in Irondale and was on staff here that same year. His wife Georgia sewed rubberized cloth together so he could make City Hospital's first oxygen tent in 1932. Dr. Turner went full-time into anesthesia in 1953 and retired in 1963. One son, Kenneth W., followed him into anesthesia; the other, Arthur A., became a dentist. KENNETH W. TURNER. M.D., 1923 - Trained as an anesthesiologist; went into practice in partnership with his father, A.L. Turner. Retired in 1991 after, 38 years in practice. MILTON WOLPERT, M.D., 1903- 1974 Internal medicine physician who roomed with Dr. Jacob Schoolnic at West Virginia University and Rush Medical College, graduating in 1931 (a year ahead of Dr. Schoolnic, whom he persuaded to come to practice here.) Practiced 1931-47 in Chester. Dr. David Pugh took over practice there when he moved office to East Liverpool. Other physicians who are known or believed to have practiced in the East Liverpool area: H. Grant McDade, M.D., :Dr.G.W. Wentz, Chester, Dr.W.R. Clark, Dr. RS, Wellsville, Dr. J Howard Davis, Dr. McCullough, Dr. Swift, C.B.Ogden,. M.D., Charles Campbell, M.D., J. Arthur Metz, M.D., Dr. E.G. Kuhlman, M.D., Francis R. Harrison, M.D., Dr.Holland.